Does Expensify accept feature requests? Enter, the Idea category. This space houses the brilliant ideas our customers are most passionate about; giving them a chance to improve a product that affects their daily life. Every time you share a feature request in this category, other customers have a chance to vote for and weigh in on the Idea. We use the demand (number of votes) and the use cases shared to ensure that Expensify is a customer-driven product. 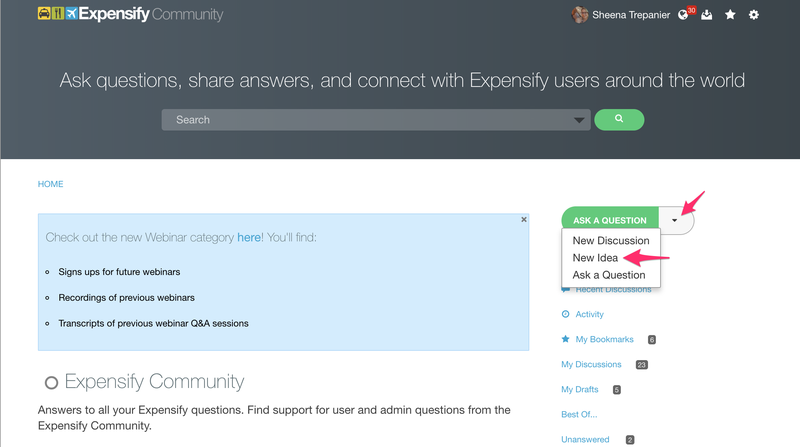 Your voice helps shape the future of Expensify and we encourage you to use it! The best place to start is by searching the Community for an existing Idea thread. Another customer may already have shared an Idea that's received multiple votes and use cases. By adding to an existing thread instead of creating a new thread, you’re helping to make sure the demand for the feature isn't diluted. Searching for an existing thread is easy! Search one or two keywords about your Idea. Click on the Idea thread that matches yours and vote for it. Don’t forget to share a bit about why and how the feature would benefit you! If you’re unable to find an existing Idea, feel free to create a new Idea thread. Creating a new thread requires you to sign into the Community. 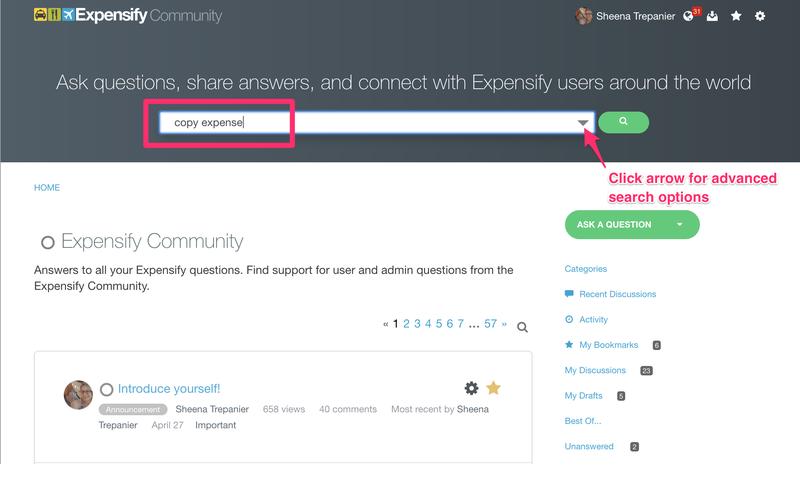 To access the Community, you'll use the same login credentials you use to access your Expensify account. Select “New Idea” from the drop-down. Select “Ideas” for the category, enter a descriptive title and submit your Idea. That’s it! You've shared your idea with us and we can start to gauge the demand and support for the feature or functionality. Don’t forget to vote for your own Idea! Creating a post that is clear about why the Idea is important and should be added, is key to its success. You wouldn’t vote for an Idea with no context and we find it hard to support building something without it too. We implore you to include as much information as possible, using the below suggestions to guide you. How is it different than what we already offer today? Why do you need this feature or functionality? How will you use this feature or functionality? If we don’t have this feature or functionality, what does that mean for you and your workflow? How would this benefit other customers? If your Idea is specific to one of our integrations (QuickBooks Online, Zenefits, or NexTravel for example,) how would your Idea work with that other product? Tell us the ‘big picture’ - what precedes this in your workflow? What is the desired end result? Sharing a well thought out Idea is paramount to getting it on our roadmap, but other factors are also taken into account. Is the Idea something that goes against Expensify’s core philosophies? Is this feature something that will only benefit one user or one company? Sharing it with other members of your team. Chances are if you want a feature then you have colleagues who want it too. Ask them to vote for it! Do you participate in any online groups related to your profession? 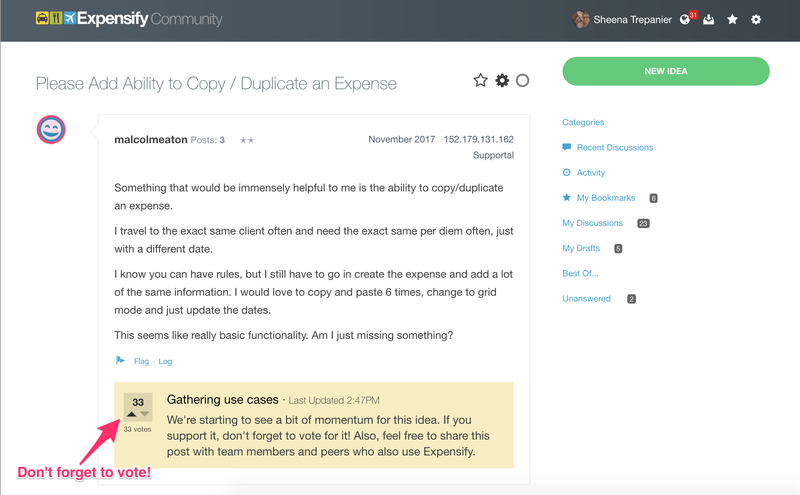 You may have recommended Expensify to peers who would vote for your Idea. Did you set up your client on Expensify? If they use Expensify they’ll have an opinion and may be the perfect person to vote for your Idea. Sharing your post in other Community threads. If you see another customer asking if something is possible, and you know there is an existing Idea thread they could vote on – feel free to share it! In the end, your ideas, your passion, and your commitment to keeping Expensify great now and in the future is what drives us to improve the product. So please, share your idea or give support to one from another customer and help us shape the future of Expensify. Want to jump right in? Search our Ideas category today!